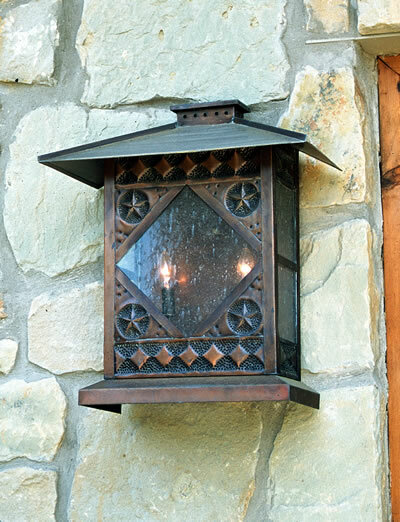 A simple craftsman style wall lantern can find itself at home in any number of settings. 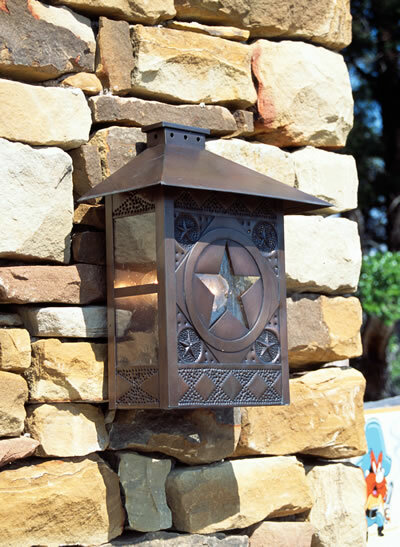 A decorative copper wall sconce that is great for outdoor accent lighting. Decorative copper wall sconce with clear water glass. 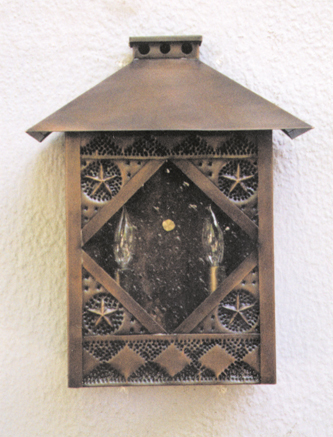 Pierced and assembled metal, a sturdy enclosure with interest both at night and during the day. A smaller cousin of the QMWS. the pierced and assembled metal achieves a sturdy enclosure with interest both at night and during the day. Featuring the unofficial animal of the Central Texas area, the armadillo, this sconce lends itself to the more whimsical application. 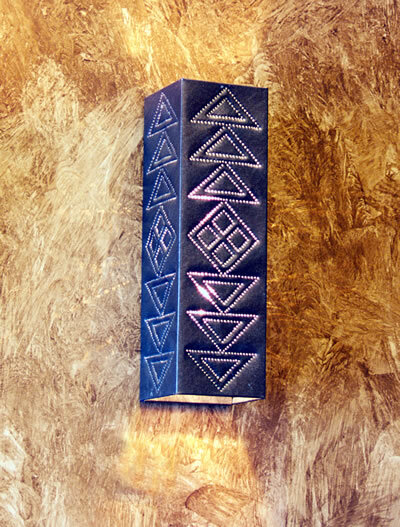 Yet another example of the weaving we do at Texas Lightsmith, this sconce combines a welded frame with woven strips to allow a wash of up and down light while keeping a tactile interest both at night and during the day as light plays on this pronounced weave. 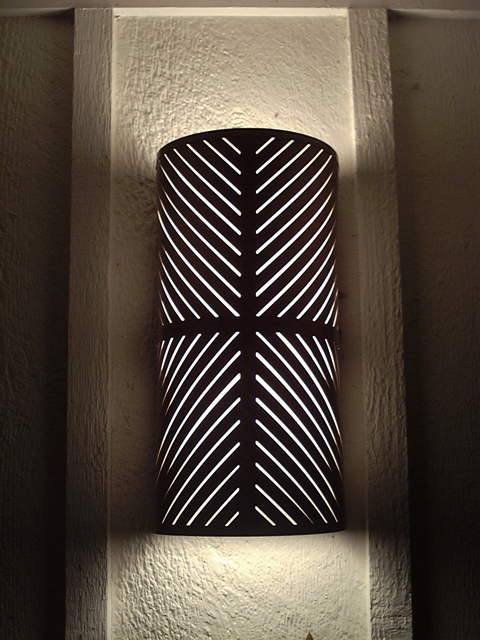 A simple weave of metal with notches for a dynamic light pattern on the sides allows this sconce to beautify any area during the day as well as at night. 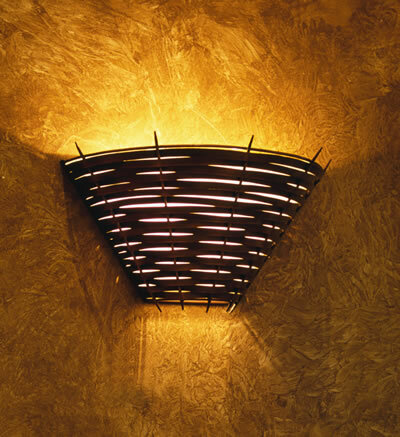 Metal strips crisscross a slumped glass cone in this fixture. 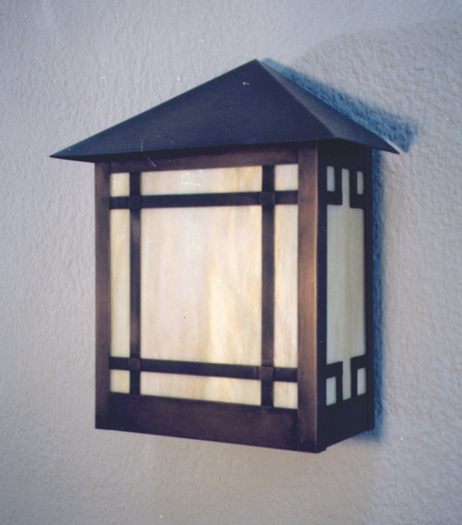 This wall lantern embodies a more traditional look for either a commercial or residential setting. 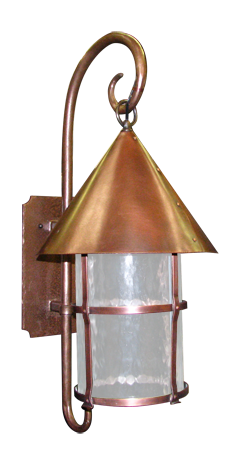 Made entirely by hand at our studio, the metal is formed and assembled to achieve a fixture with a clean attractive look by day and an effective area illuminator by night. 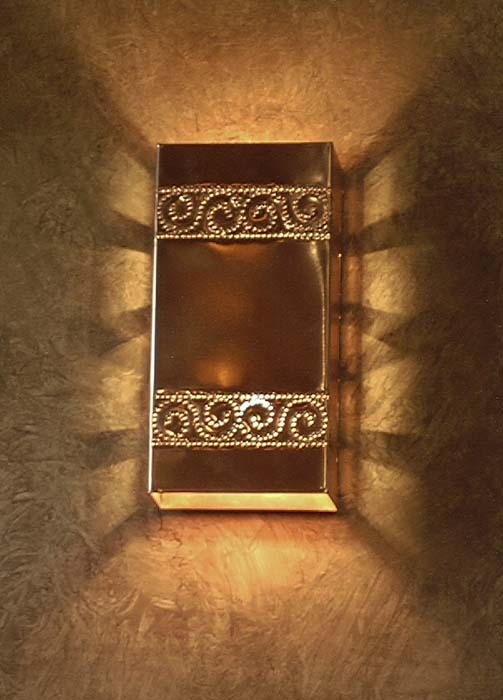 The pewter of this rectangular wall sconce is “pierced” or “hand punched” and assembled to achieve a sturdy enclosure with interest both at night and during the day. 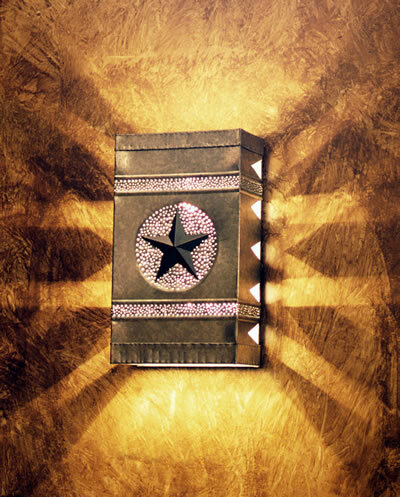 Formed, assembled metal and glass, with a Texas star. Formed / assembled metal; glass, mica, or acrylic. Shown in Dark Pewter with “zebra” glass. 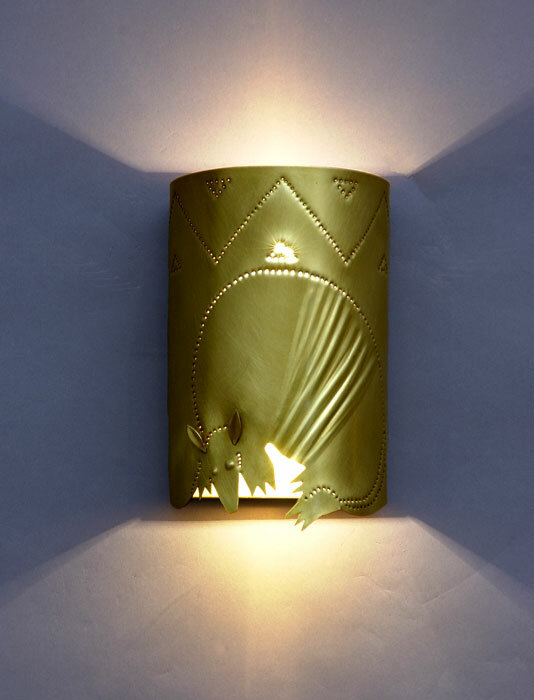 Formed and welded metal wall sconce, an economical, yet attractive option for a commercial or residential setting. 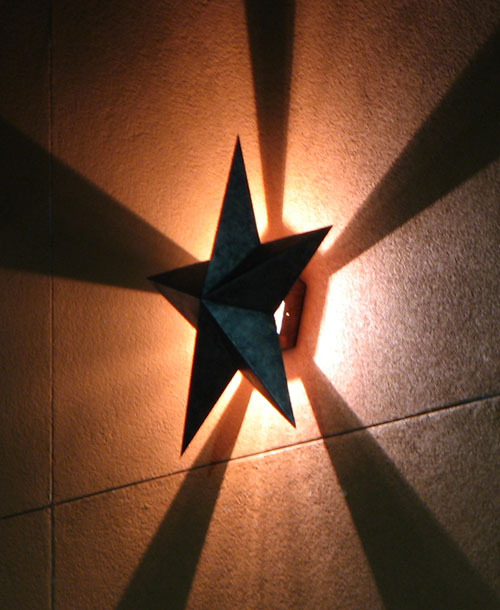 Three dimensional Lone Star wall sconce floods light against the wall in a reverse star pattern. Made to order and sealed to withstand exterior elements. 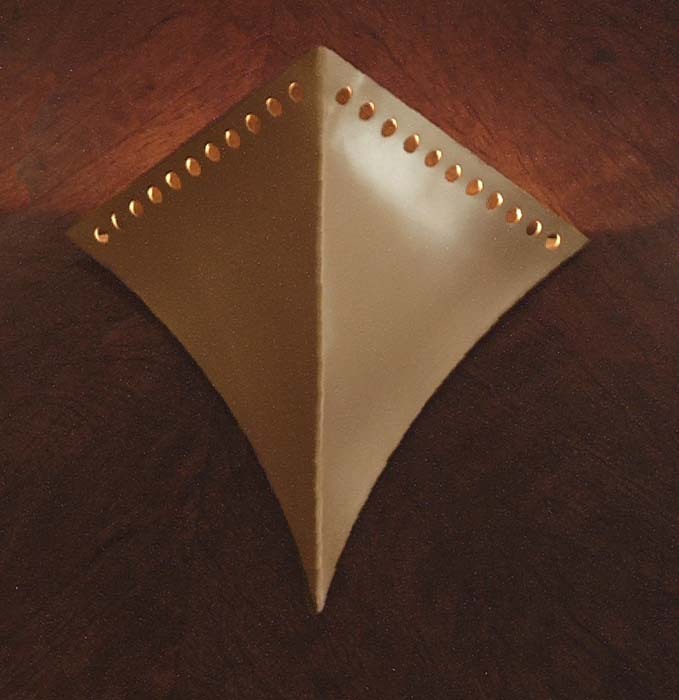 Formed; pierced metal with triangle patterns and up and down light. 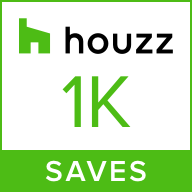 An economical, yet attractive option for a commercial or residential setting. 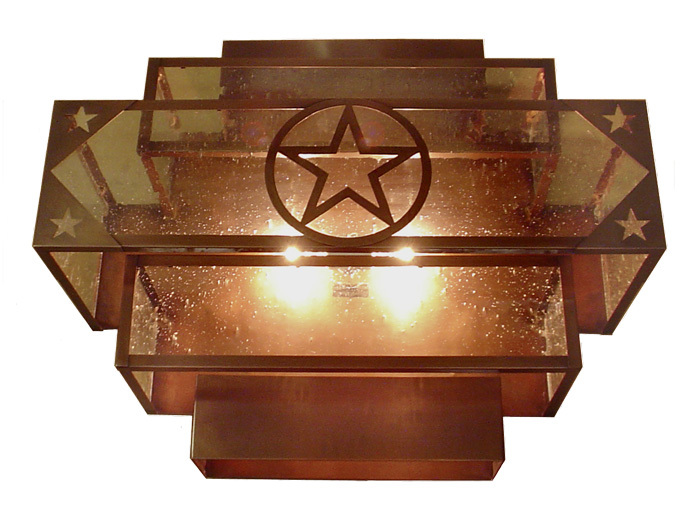 Shown here in copper with an oil-rubbed finish. 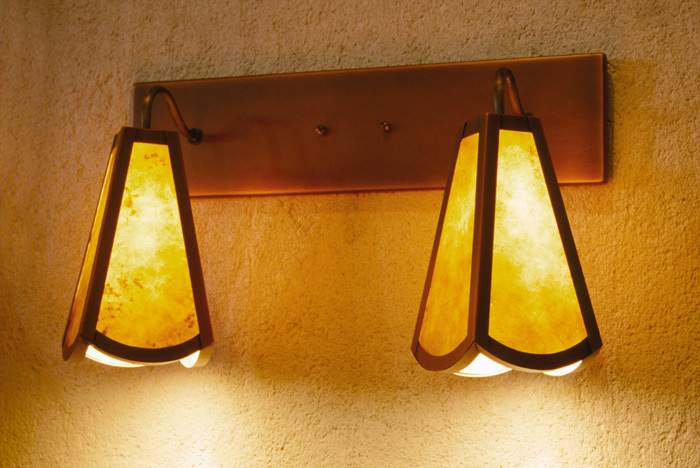 Amber mica shades and medium copper finish make this dual shade fixture a perfect accent for a traditional or classic style home. 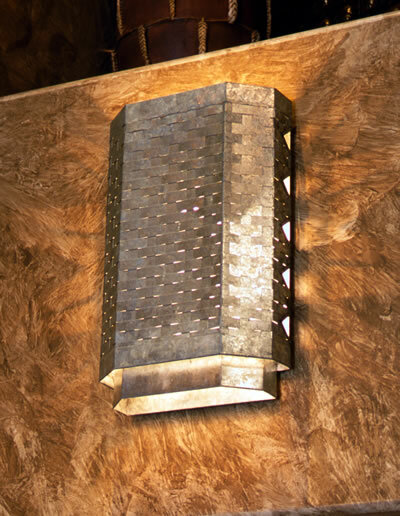 This sconce uses its conical shape and punched metal to dramatically distribute light. 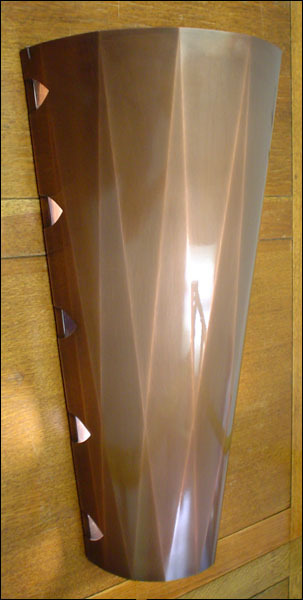 Shown here in a medium copper finish. 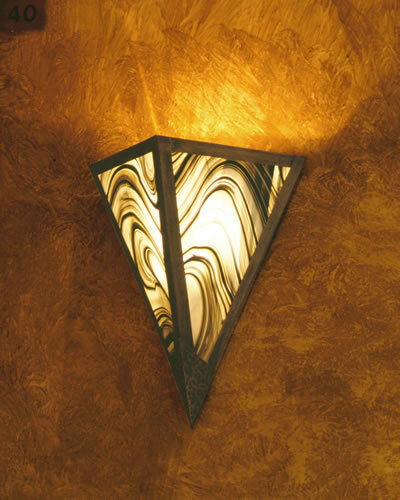 This sconce employs an onlay of strips over a diffuser to create a dramatic effect. 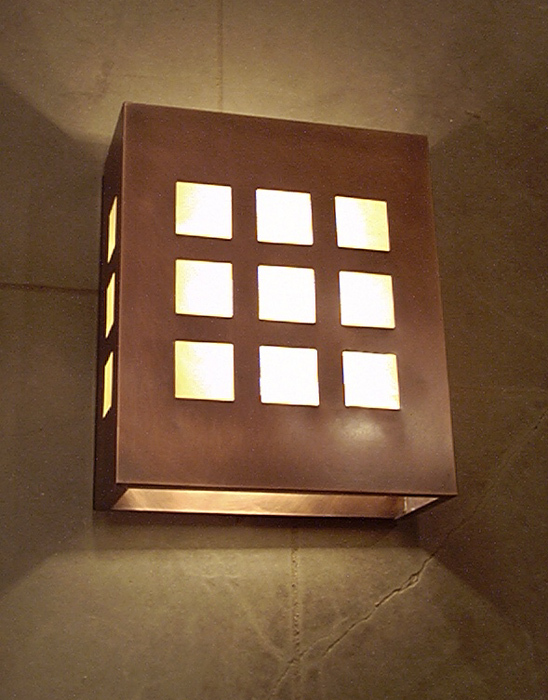 Made entirely by hand at our studio, this piece combines visual interest and function. 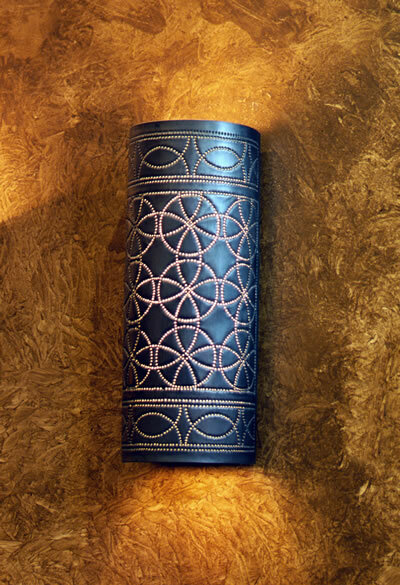 Shown here in a darkened copper finish. 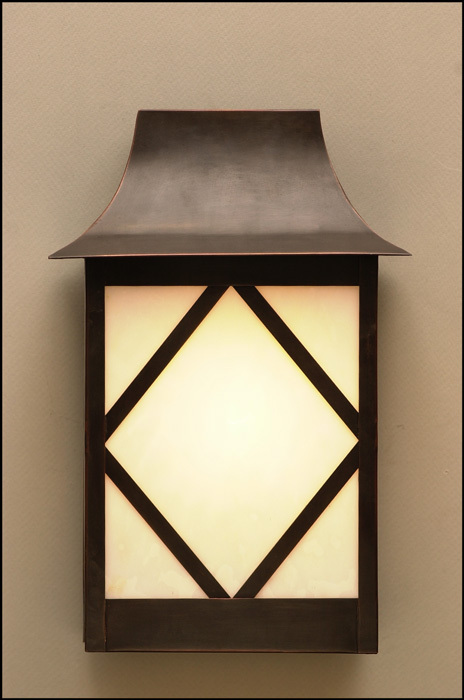 This light fixture is made of copper and finished with “Venetian Oil Rubbed Bronze”. 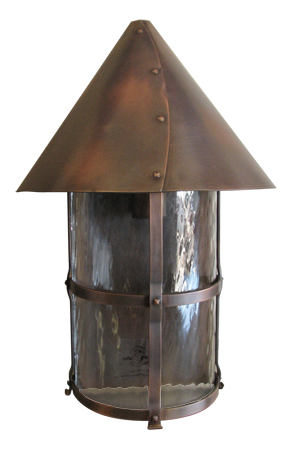 There are many finishes to choose from as well as a variety of materials and glass or mica diffusers. 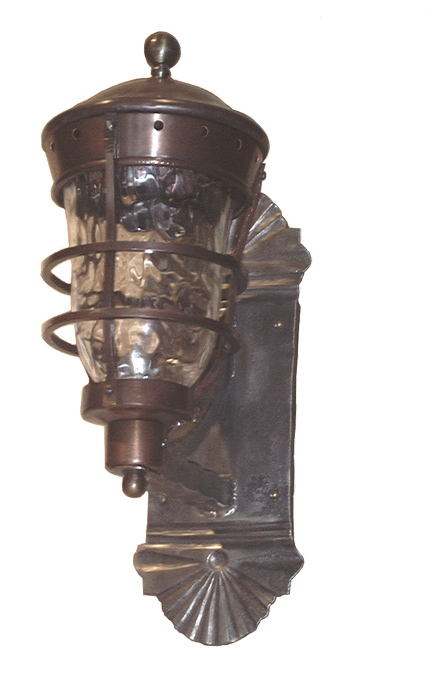 Copper wall sconce punched, repoussé, assembled metal and glass – two candelabra base lampholders. Shown in medium copper with clear seedy glass. 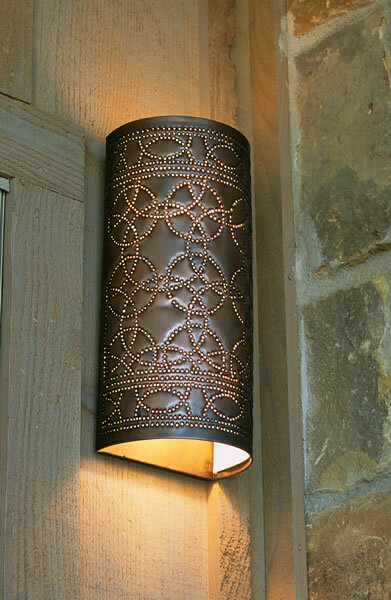 Copper wall sconce shown here with hand punched designs. Glass, mica, or acrylic diffusers available. 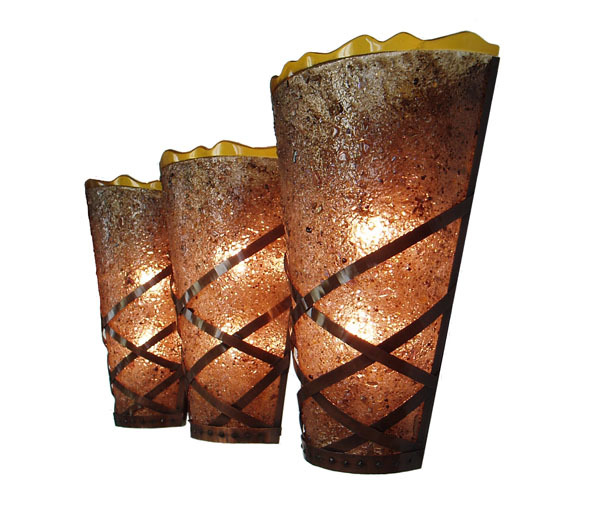 Shown here with seeded glass diffuser and finished in dark copper. UL damp listing available for outdoor use. Cut and assembled metal; shown in medium dark copper w/ glass. 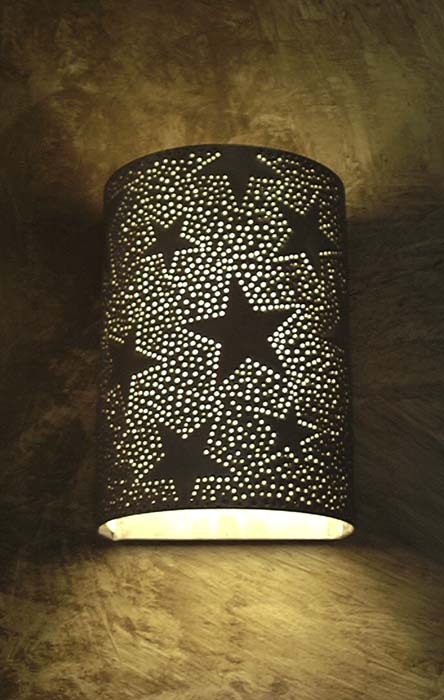 Formed / assembled metal; hand punched; 3-D hand made star; rolled beads. Shown in galvanized steel. 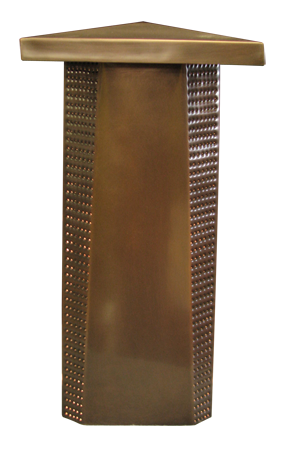 Hand forged steel base; hand formed, riveted, and welded construction. Hand-blown glass; may be gas or electric. 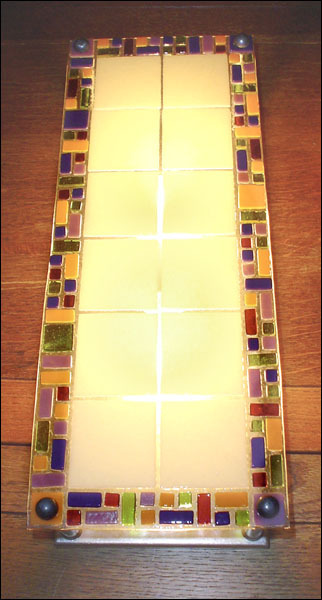 Fused glass panel wall sconce. 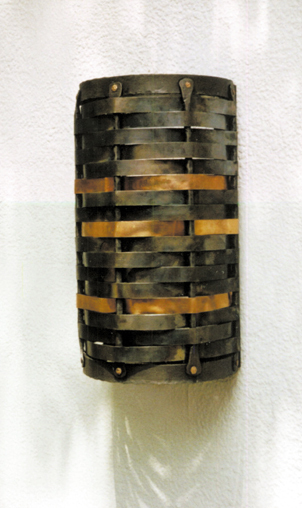 Wrought iron sconce with woven steel, copper strips, and hand driven rivets.